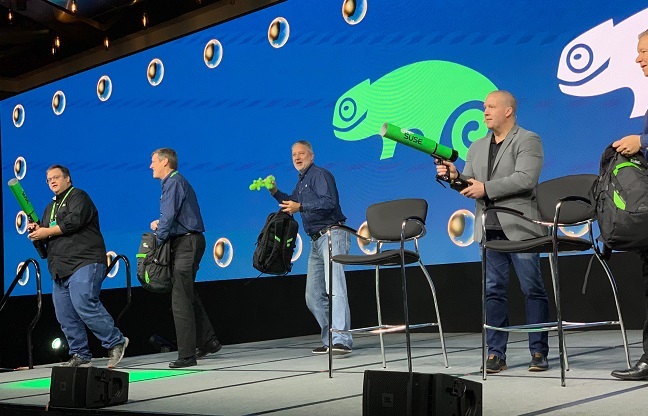 Interview Some might say we had it coming, but as newly minted SUSE Engineering boss Thomas Di Giacomo's keynote came to an end, this Reg hack took a chameleon to the face. Admittedly, the plush toy didn't do any damage, being soft and cuddly. Which is how Linux veteran SUSE likes to market itself – friendly to developers and enterprises alike. While the president of engineering, product and innovation at SUSE was keen to trot out the multi-cloud vision via an increasingly tortured gaming metaphor (as well as educating the audience in the pronunciation of SUSE) things got a bit more Serverless in an interview. Preferring the term "Function as a Service", Di Giacomo told us that serving up the tech for developers is the next logical step for SUSE. Then he sloshed around the bucket of scorn a little: "Today there's no good open-source function service solution that is completely agnostic." Knative? "It's good for Google, it's good for IBM, it doesn't run on Microsoft Azure, it doesn't run on AWS." Lambda? "AWS Lambda is good for AWS, but nobody else." He agreed, however, that Kubeless was "definitely an interesting open-source FaaS project" before getting excited about CloudEvents and the prospect of standardising event definitions over all manner of FaaS frameworks, including Lambda, Google and Azure. In words to warm the heart of SUSE CEO Nils Brauckmann, Di Giacomo also cited management across different types of clouds as something "that could be improved still in the industry". While SUSE Linux will run pretty much anywhere, be it AWS, Google, on-premises or in the public cloud, Di Giacomo pointed out SUSE has a "tuned" kernel for Azure. There is also, of course, that whole SAP HANA thing. For that, Di Giacomo told us: "We try to stay generic, but we have to also accommodate the fact that Azure is doing things differently than our other cloud service providers. So we work together with them and what specific stays on the Microsoft sites, and what we build on our product is generic enough that we can re-use it elsewhere." Back to the keynote, and Di Giacomo introduced SAP veep of product marketing, Daniel Lahl, on stage. Lahl brought a bottle of Jack Daniels whiskey, which he found himself reaching for when Di Giacomo politely asked when HANA might be open-sourced. Still, although Lahl joked that SAP's motto might once have been "my kind of closed", SUSE were open enough to share their house band, famed for such travesties parodies as "Uptime Funk" and "Paint it Green" with the botherers of big data. SAP opted to ditch the whimsy and went with something loud, shouty and angry-sounding. Or maybe that was just their users.